RUSSELL: I was born in 1961 in Fort Stewart, GA. For the most part I was raised in Statesboro, GA. My teen years were spent in Conyers, GA which is just East of Atlanta, and where I still reside today. RUSSELL: I'm just an average guy with an incurable need to draw. During my youth I spent a lot of time playing football (I was the only kid that showed up to practice with his trombone case), baseball, basketball and swimming at the pool at the recreation department. I loved to read comic strips when I was a kid, and I remember tracing them. My favorite was Prince Valiant, drawn by Hal Foster. I didn't see a comic book until I was 12 years old when a friend at school gave me a Spider-Man comic book, and I was hooked. After that I always had a comic book in my hand and dreamed about one day becoming a comic book artist. I was always drawing something, but I didn't take any art classes until my senior year in high school. I entered and won a contest with a painting I did that was based on some Frank Frazetta paintings. I was a Music Education Major at GA Southern University. I was a really big band geek, and I don't think I really got back into art until I was on a committee to come up with the marching band uniform, and they chose my design. I soon found myself drawing more than practicing my trombone, so I later changed my major to Art. However my financial aid ran out at that time and I wasn't able to finish getting my degree. Then, I moved to El Paso Texas, where again I was an Art major, and a substitute teacher for three years. Again my financial aid ran out and so I moved back to Georgia and worked retail for several years. But, when I lost my job in 2007, I came to a turning point in my life, where I realized that I really wanted to return to my passion of illustration and finish my degree. So, I went back to school and this time I did get my degree, a BFA in Visual Communications with an emphasis in Digital Design. For the past 4 years I have been doing freelance art jobs. I have been married for 13 years to my beautiful wife and we have a handsome, intelligent 12 year old son. He is way smarter than I was at his age, taking all advanced classes at school. But, he is still a chip off the old block, as he is in band and loves to draw and read comic books also. My wife and I are on serving on the Executive Board of directors for his band this year and are involved in fundraising for the organization. In our spare time, we enjoy watching Sci-Fi, sports, and cooking competitions on television, going to the occasional Atlanta Braves game, playing games with our son, and cooking. I've been told that I make an awesome omelet, and I bake a darn good chocolate chip cookie. RUSSELL: I've been drawing comics for a while now, about 18-20 years. As a professional, where I've gotten paid for my work, that's only been a few years. RUSSELL: My first step into the industry was in 1995 as an inker on issue #6 of White Raven published by Visionary Comics. I inked everything except the last page because the penciler wanted to do that. I thought I was going to get my foot in the door, but after sending samples of work to other companies, and being consistently rejected, I got discouraged and quit trying for a long time. Then a few years ago I discovered a website called freelanced.com where artists can post their work and get hired for freelance art jobs. It was there that I hooked up with a writer, Charles Hyatt. I penciled, inked, lettered and colored his book, Nick Copernicus, Private Eye to the Stars. It's about the real life astronomer, Nicholas Copernicus, who goes through a wormhole and lands in modern day time becoming a detective, solving crimes. It's not in comic book stores yet, but if anyone would like to buy a copy you can contact me to get one. I have also drawn a story for Red Leaf Comics recently, called Nightrunner: Eventide, which was particularly fun for me, because the superhero is Canadian, and I have relatives in Canada. Currently, I am finishing up a story called Professor Vibrant by Jay Burch. While I have found work doing freelance projects for independent writers and publishers on freelanced.com, my goal is still to get a more stable gig with a comic book company. I know I have the passion for the work and the talent to match, but I guess I just haven't gotten my work in front of the right people yet. Who knows, maybe someone who reads this article will be the one to give me my big break! RUSSELL: Yes, I have a BFA in Visual Communications with an emphasis in Digital Design. I have formal art training in printing, painting, ceramics, wood-working and of course illustration. I learned to use the Adobe Creative Suites while earning my BFA at AIU, and use it frequently in my artwork. RUSSELL: The artists that I look up to would be a long list, Foster, Frazetta, Swan, Byrne, Williamson, Davis, Kirby, Simon, Adams, Bagley, Conway, Cardy, Kane, Steranko, let's end with that one or there won't be anything left but names in this interview. RUSSELL: I used to listen to music when I drew, but I would start singing along and stop drawing so now I keep the radio off. I do like to listen to the news and have a cup of tea or coffee while working. I also keep focused on the work sometimes by walking away for a while, and coming back to look at it later with fresh eyes. RUSSELL: I'm still an old school artist at heart, doing pencils and inks by hand to begin a project, although I have done some all digital work. After penciling and inking a piece by hand, I use Photoshop for cleaning up, coloring, and adding textures and special effects. I use Manga Studio for lettering. I recently got a Wacom Tablet that I am still learning how to use. RUSSELL: I was 12 years old, and it was a Spider-Man comic book where he fought the Sinister Six. I believe it was drawn by Steve Ditko. Up until then I had only been drawing singular, static images. After I read that first comic book, it inspired me to start drawing sequential, action filled stories. I also started experimenting with forced perspective in my illustrations. RUSSELL: I still read my old favorites, Spider-Man, Avengers, X-Men, Justice League, Bat-Man. But, if I see something new that catches my eye, I'll pick that up as well. Recently, I have been enjoying The Leaf, Canada's greatest superhero. RUSSELL: I like being able to hold the comic book in my hands, but I'm not opposed to digital. I think in today's day and age that digital gives new artists and self-publishers a great way to get their work out there quickly and reach the masses. Digital is a great marketing tool, but in the end I believe that people want something tangible that they can hold as well. RUSSELL: Sometimes I will have my wife take pictures of me in a pose so that I can look at it and get the body positioning right on a character. If the writer wants a backdrop of a specific city or building on the cover, then I will Google images of that to refer to. You can basically look up any image on Google that you might need for reference. RUSSELL: When I was in college, I designed a marching band uniform for Georgia Southern University. I've painted murals and done printmaking. I have drawn images for print ads and designed logos. I've drawn a couple of Biblical scenes for church bulletins. But, my favorite thing to draw will always be comic books. 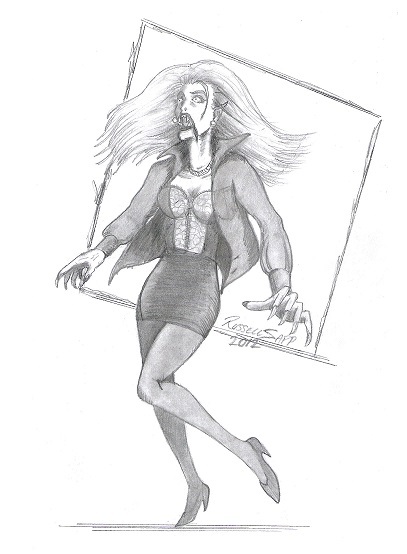 I have drawn various genres including Sci-Fi, Fantasy, Supernatural Horror, and Superheroes. JMH: What project are you currently working on right now? RUSSELL: Right now I am drawing a portrait of a lady as her super-heroine persona to be framed and displayed in her home. I'm drawing a new character for Charles Hyatt called Man-Cave Caveman. I'm also finishing up pencils, inks, and lettering on a story by Jay Burch called Professor Vibrant. RUSSELL: I just started illustrating a WWII story for Red Leaf Comics. I'm currently talking with Emerald Star Comics about the possibility of being an illustrator on their new upcoming series, Invasion, a 50's style Sci-Fi/Horror Anthology featuring 3 stories each month. RUSSELL: The most important thing is to hone your craft by practicing constantly and learning to use all of the tools at your disposal. Also, I think it's OK to imitate a famous artist's style to start off, but eventually you should develop your own. Whenever you feel like you can't draw something, or someone tells you that you won't make it in the industry, that's when you have to dig deeper and try harder. Your dreams are attainable, so never give up! JMH: Russell, CBI appreciates your time. All the best. RUSSELL: Thanks, it's always a pleasure to have someone interested in my work and discuss what I love to do...drawing comics! 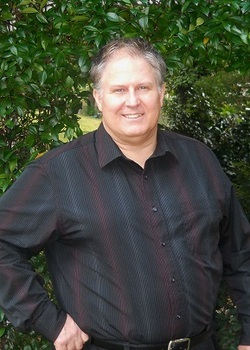 John Michael Helmer is the Publisher and CEO of Red Leaf Media, LLC. Red Leaf Media operates:www.ComicBookInterviews.com & www.RedLeafComics.com. John’s creator-owned properties include: The Leaf, Canada’s Greatest Hero, Sky Watcher, G.I.s versus Zombies,McSorly, RCMP, The Armor Guardians, The Huskie, Dune, Master Spy!, and many others.